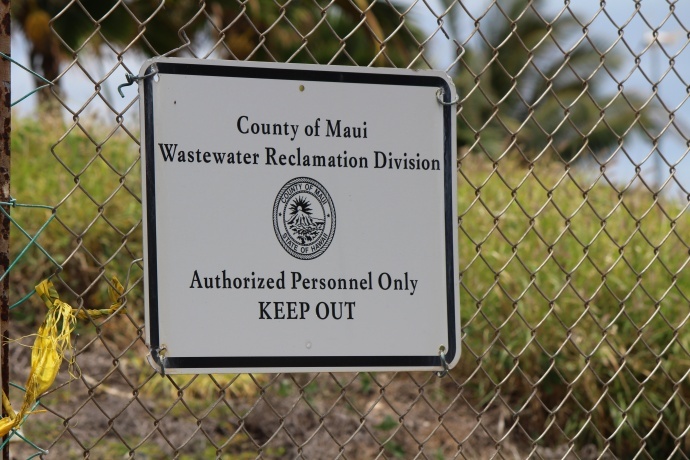 A panel of the 9th US Circuit Court of Appeals ruled today that the County of Maui’s Lahaina Wastewater Reclamation Facility has been violating the US Clean Water Act since the facility was first put into operation in the early 1980s. 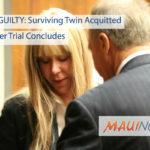 Today’s ruling upholds a 2014 decision by the US District Court for the District of Hawai‘i. According to information released by the environmental law firm Earthjustice, the county tried to argue that the discharge of pollution from the facility’s wells did not require Clean Water Act permits because the pollutants did not flow directly into the Pacific Ocean, but indirectly through groundwater. “Both the district and appeals court judges found that argument unconvincing,” Earthjustice representatives said in a press release. According to Earthjustice, the Lahaina facility injects 3 million to 5 million gallons of treated sewage into groundwater each day. In 2011, an EPA-funded study used tracer dye to show conclusively that the Lahaina sewage flows with the groundwater into near-shore waters off Kahekili Beach, where it has been linked to algae blooms that smother the coral reefs and other degradation of this unique marine ecosystem. The Ninth Circuit affirmed the Hawaii District Court’s summary judgment rulings that the County of Maui violated the Clean Water Act through its operation of injection wells a half-mile inland to dispose of excess recycled water. In so holding, the Court fashioned a new theory of liability, where any small fraction of pollutants that can be fairly traceable to a source triggers liability. In creating this new theory, the Court rejected both the U.S. Environmental Protection Agency’s opinion as well as the plain text of the Clean Water Act itself. The County is reviewing the order. In the meantime, the DEM has continued to aggressively pursue recycled water reuse as a primary goal. These projects are not inexpensive to install and to operate – the energy costs of pumping water from place to place are very high and are dependent upon Council’s appropriation of sufficient budget. Kihei – DEM is going out to bid next month for construction of a new 1 million gallon recycled water storage tank, which will double the amount of storage and pressurization for distribution of recycled water in South Maui. The current users of the recycled water utilized enough recycled water to empty the existing 1.0 million gallon recycled water tank more than once a day. The second 1.0 million gallon recycled water tank will allow us to consistently irrigate the other properties. 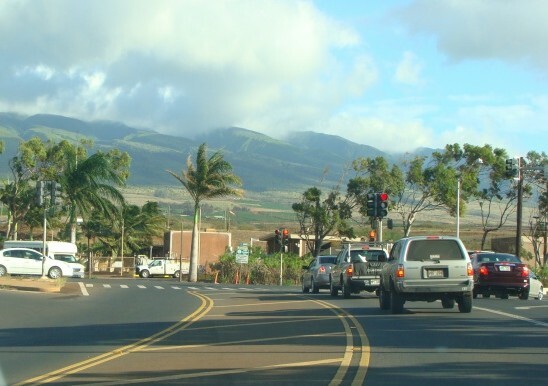 The County is also moving forward with an agricultural/land application project in the vicinity of the Kihei WWRF located on 150 acres owned by the County. Molokai – working with landowners near the Kaunakakai Wastewater Reclamation Facility on the potential for land application of the recycled water for agricultural irrigation use. Kahului – we are working with the State Department of Transportation, Airports Division, to provide them with recycled water. We have initiated a renewable power generation project in Kahului that will use biocrops as a feed source which will be located in proximity to the airport. We are coordinating with the Airports Division to utilize their line to provide recycled water for the 500 acres of biocrops. This should utilize all of 4.0 million gallons of recycled water from the Kahului Wastewater Reclamation Facility’s recycled water. The County is also investigating use of soil aquifer treatment basin as an advanced and environmentally sound means of disposing of any excess recycled water. Lahaina – we are working on an alternative disposal method instead of using the injection wells as the primary source of disposal. This alternative utilizes an existing reservoir located at the 800 foot elevation, and plans are to utilize existing pipeline infrastructure to pump the water up to this reservoir and utilize the excess recycled water for irrigation. Lanai – already at 100% reuse. 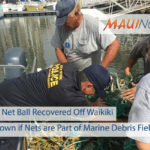 In 2017, the US Geological Survey, the State of Hawai‘i’s DLNR’s Division of Aquatic Resources, and other experts published a peer-reviewed study documenting the ongoing, serious harm to the reef at Kahekili associated with the Lahaina facility’s discharges to the ocean. 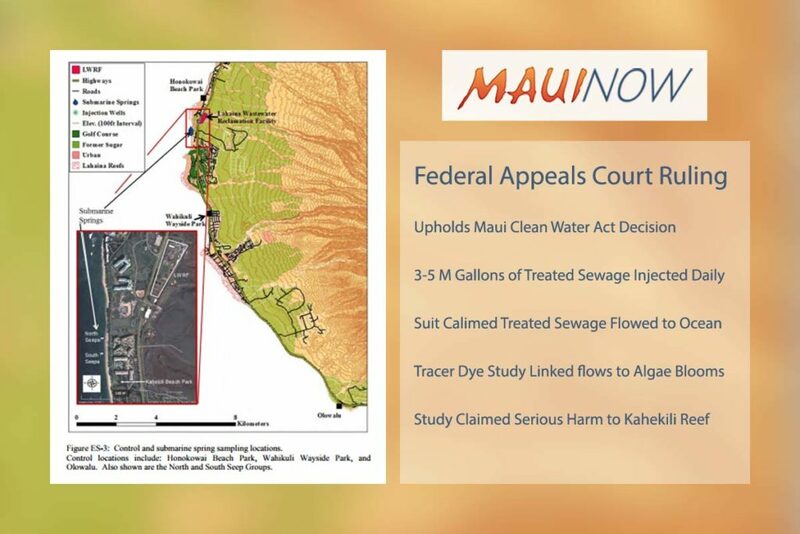 According to Earthjustice, the court also found that the Clean Water Act’s “plain language” gave the County ample notice a Clean Water Act permit is required for the Lahaina facility.